Abstract : The ever growing amount of heterogeneous data exchanged through the Internet, combined with the popularity of XML, make structured document transformations an increasingly important application domain. Most of the existing solutions for expressing XML transformations are textual languages, such as XSLT or DOM combined with a general-purpose programming language. Several tools build on top of these languages, providing a graphical environment and debugging facilities. Transformations are however still specified in a textual way using the underlying language (often XSLT), thus requiring users to learn it. We believe that visual programming techniques are well-suited to representing XML structures and make the specification of transformations simpler. 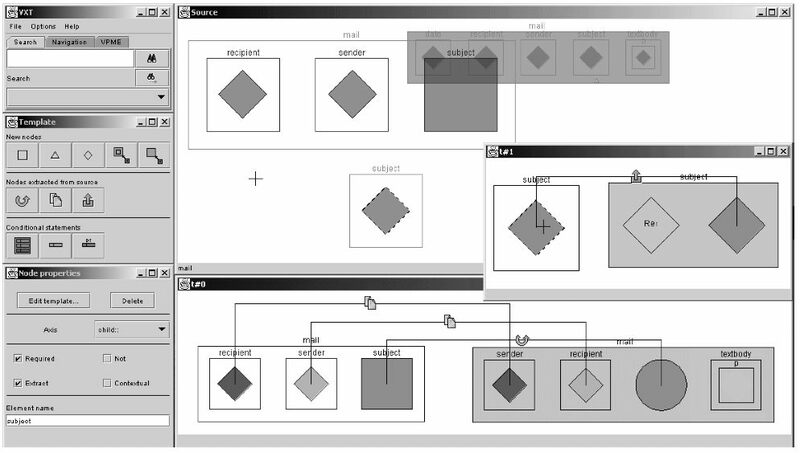 We propose a visual language for the specification of XML transformations in an interactive environment based on a zoomable user interface toolkit and on two target languages specialised in structure transformations: Circus and XSLT.